This is a chipped race with results text to runners a short time after the race finishes. 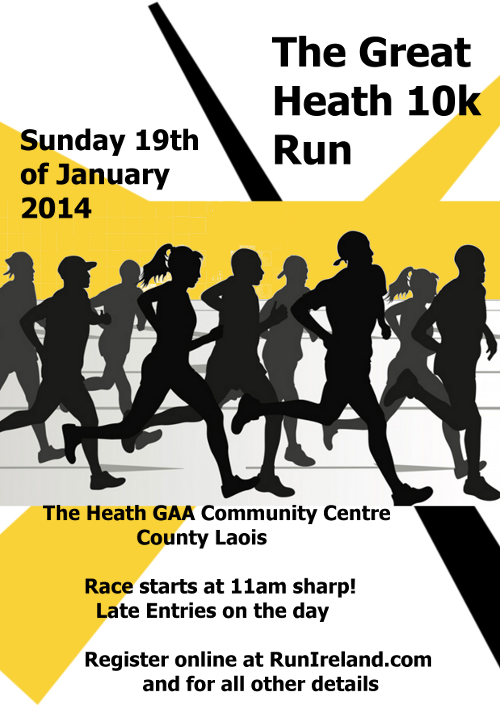 The route is a scenic run through the countryside of Shaen, Ballydavis and The Heath. The route is generally flat and suitable for first time entries. Hot and cold refreshments along with food are served after the race in the clubhouse. The prizes on offer are as follows: (Men & Women) 1st 250e, 2nd 150e and 3rd 50e. The technical t-shirt is a unique Savy sports design. This race is fully marshaled and we pride ourselves with not allowing traffic on the race route. Coming from Dublin (on M7): – At junction 15, exit toward R422/Móinteach Mílic/Mountmellick/Cúil an tSúdaire/Portarlington/Cill an Áird/Killenard – At the roundabout, take the 3rd exit (Onto next roundabout). – At the roundabout, take the 1st exit onto R445, continue for approx 4.1km. – When you see Treacys Restaurant (Hatched roof) take next left, clubhouse is 100m straight ahead. Coming from Cork/Limerick (on M7): – At junction 16, take the R445 exit to Port Laoise/Ceatharlach/Carlow – At the roundabout, take the 2nd exit onto R445 (signposted The Heath). – Continue for approx 2.5km. Take next right and the clubhouse is 100m straight ahead.